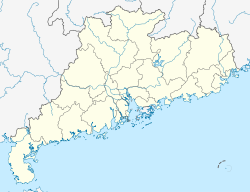 Longgang District (simplified Chinese: 龙岗区; traditional Chinese: 龍崗區; pinyin: Lónggǎng Qū; Jyutping: lung4gong1 keoi1) is one of the nine districts of Shenzhen, Guangdong. It is located in northeastern Shenzhen. With an area of 682.87 square kilometres (263.66 sq mi), Longgang District is one of the largest districts by area in Guangdong province. The population of the district is 1,831,225. Longgang was established as a district on January 1, 1993. Archaeologists discovered antiques which dated back 7, 000 years ago in Xiantouling (咸头岭) of Longgang District. Huawei is headquartered in Longgang District. China South International Industrial Materials City (Shenzhen) Co., Ltd. Most of the beaches are in Dapeng New District. ^ "Contact us Archived 2010-11-01 at the Wayback Machine." Huawei. Retrieved on February 4, 2009. Wikimedia Commons has media related to Longgang District, Shenzhen. This Shenzhen-related article is a stub. You can help Wikipedia by expanding it. This page was last edited on 31 March 2019, at 00:51 (UTC).